"41AN34 - 29, Burial D-4" by Timothy K. Perttula and Robert Z. Selden Jr.
DECORATION (INCLUDING MOTIF AND ELEMENTS WHEN APPARENT): The rim panel is defined by single upper and lower horizontal engraved lines with upward- or downward-pointing tick marks. The rim panel is divided into three sections by either large opposed engraved pendant triangles filled with cross-hatched lines, or a set of three closely-spaced curvilinear engraved lines. There are pairs of two hooked arm elements (with three curvilinear lines) in two of the panel sections, and one pair in the third panel section. The outer lines of each of the hooked arm elements have outward-facing tick marks. The vessel body has horizontal brushing marks. Patton Engraved, var. 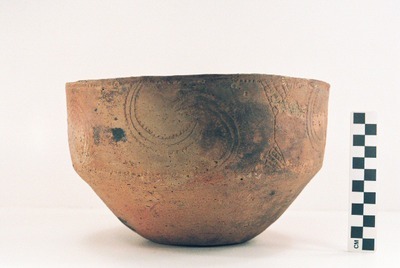 Patton carinated bowl from the Pierce Freeman site.